The royal wedding inspired so many feelings this weekend. There’s a lot to unpack about this event, but it seemed like a real-life fairy tale. Prince Harry and Meghan Markle became the Duke and Duchess of Sussex when they married on May 19, and honestly, we’re reeling over how they looked at each other when Harry removed Meghan’s veil. Of course, the royal family always has to step it up a notch, so Kensington Palace posted some utterly adorable photos on the official palace Instagram on Monday. Duchess Meghan and Prince Harry are simply glowing. In the first photo, the newlyweds are surrounded by family. Meghan’s mother, Doria Ragland, stands beside her, with Prince William, Duchess Catherine of Cambridge (known better in the States as Kate Middleton), Princess Charlotte and Prince George to her left. To Prince Harry’s right are his father, Prince Charles, his stepmother, Duchess Camilla of Cornwall (otherwise known as Camilla Parker-Bowles) and his grandmother, Queen Elizabeth II. Also in the photo are several bridesmaids and page boys, who are featured in a second photo with the Duke and Duchess of Sussex as well. Look at those smiles! We love that Meghan and Harry are posed so they aren’t standing and towering over the kids — it adds a sweetness to this photo that makes it feel really warm and wonderful. Twin brothers John and Brian Mulroney, whose mother, Jessica Mulroney, is said to be one of Markle’s closest friends, frame the photo; Prince George stands beaming in front of Jasper Dyer, Prince Harry’s godson; Ivy Mulroney stands on the right side of the photo beside Prince George; Remi and Rylan Litt stand on the other side of the newlyweds; Princess Charlotte, Florence van Cutsem and Zalie Warren sit beside Meghan on the floor. Then there’s this third and final photo shared by the palace, which is totally different from the other two. It was taken outside, with just Meghan and Harry, and they couldn’t look any happier. There’s a candid quality to the way the newlyweds are laughing, with Meghan’s face turned away from the camera and Harry’s legs akimbo while she sits between them on the steps. The black-and-white photo has a classic element that reminds us of all the best love stories — and theirs certainly belongs on that list. 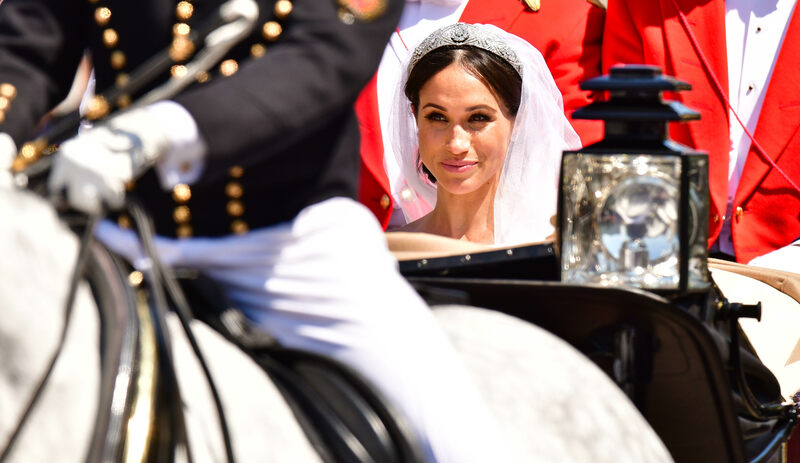 The photos were snapped by Alexi Lubomirski in the Green Drawing Room of Windsor Castle following the carriage procession and show it was a fairy-tale wedding, indeed.